One of my favourite things to do at this time of year is to go to the ballet. The Nutcracker is particularly festive, but I would happily see Swan Lake or Sleeping Beauty too. There is something special about getting dressed up, travelling up to London, and going into the very decadent Royal Opera House to see these beautiful, graceful and strong dancers tell a story without words. Ballet seems to be one of those timeless things that has been around for ever, and whilst it was popular in Europe from the 1600s, the form that we know it today only really took off in the 20th Century when Diaghilev and the Ballet Russe returned to France in 1907. In the UK, ballet didn’t really become popular for most people until the 1930s and 1940s following the establishment of what would become The Royal Ballet by Ninette De Valois. In fact, it was the second world war which would propel this company to fame. They toured the country as The Vic-Wells ballet, keeping up morale and trying to perform in London whilst the city was literally crumbling around them during the blitz. The visionary who made this company was the formidable Ninette de Valois. Ninette de Valois was born Edris Stannus in Co. Wicklow, Ireland in 1898. From a young age she was a dancer, and by the time she became the principal dancer of the Beecham Opera at age 21 in 1919 she had renamed herself Ninette de Valois. This quote from her obituary shows the determination that Ninette de Valois had to make her dream succeed. She looks like a very stern and determined woman in the photos of her from the 1940s and she lived to be 102, which takes a bit of determination. I am fascinated by ballet dancers. They have to be so strong and develop complete control over their bodies, often forcing themselves into painful unnatural positions with an expression of serenity. The performance they give is one of beauty but the behind the scenes is a lot of hard work, grit, determination and pain. For me, ballet is a reminder that when things look effortless there is usually a lot of effort that has gone in to it. The person who stands up to speak and gives engaging presentations has probably spent hours honing their words and practising their delivery. The person who mingles around a room full of people making connections has spent time honing their networking skills. Things that look effortless rarely are. 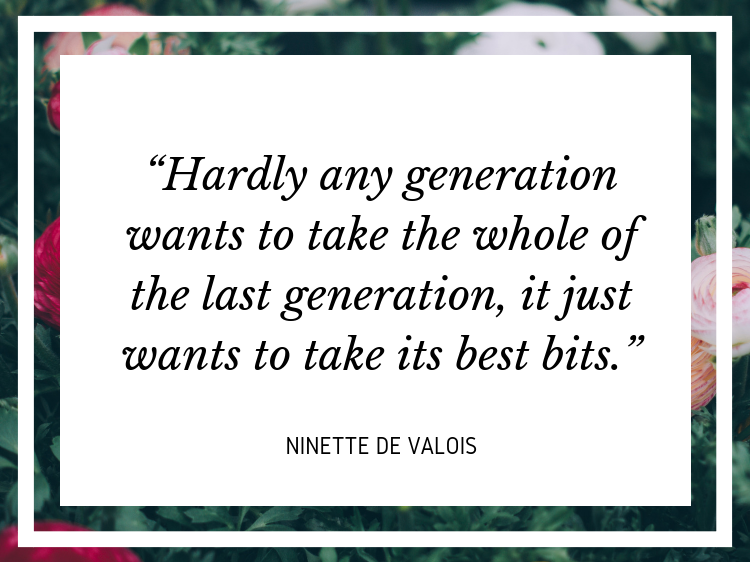 The advice that I take from Ninette de Valois is to build on the foundation of work that has come before you, “take it’s best bits” and create something new. In her productions with her ballet company, de Valois mixed the traditional repertoire (Swan Lake, Giselle, The Nutcracker and Sleeping Beauty) with new ballets that she choreographed herself such as Job, The Rake’s Progress and Checkmate. It wasn’t that the new was better than the old, but she chose to take forward things which worked and build on them. In the different areas I work there are lots of ways of working that have gone before me. One of the phrases I hear a lot is “we’ve always done it like this” which is a red flag for stagnation and resistance to change. It’s important to recognise the work that has gone before, but also to incorporate it with new ways of thinking. I am currently shifting from a traditional charity retail career to being a coach. I have noticed in the organisations that I am working in that people are choosing to leave behind the hierarchical tell approach of previous generations and encouraging a coaching culture. Rather than telling employees what to do, managers are setting out their vision for their team and coaching staff to think for themselves and problem solve. The result of this shift is a more empowered and confident workforce who are all working towards the same goal, rather than relying on a few exceptional managers to drive the business forward. Businesses are building on the strong foundations of the past but choosing to cherry pick the best bits to create something new. You will be lucky to get tickets to see The Nutcracker at The Royal Ballet this year, but have a look here for a taster.